Every so often, an airline gets to hit the reset button and totally reinvent itself. In the case of Meridiana, a small and arguably irrelevant airline with a dreadful product, the reset button was forcefully pushed by new minority shareholder Qatar Airways. Out with the old, in with the new. Qatar Airways wasted no time in refleeting Meridiana to kick off its rebranding to Air Italy. 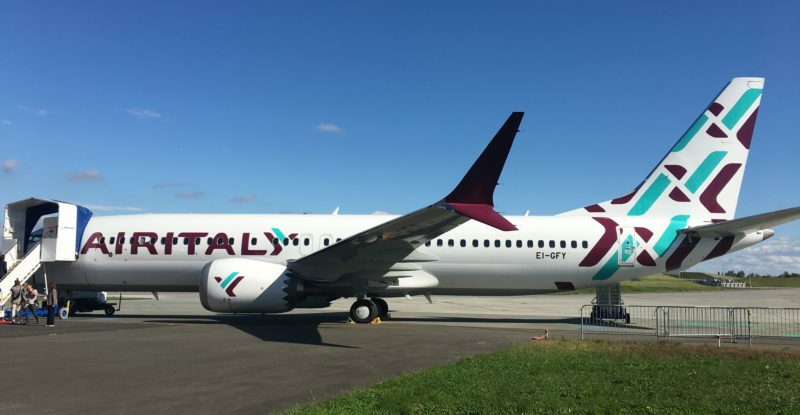 As Middle Eastern airlines have found themselves in an unexpected period of tough times, Qatar Airways has leased the first of its new Boeing 737 MAX aircraft to Air Italy. The 737 MAX will form the core of the new European fleet, which will feed longhaul flights to new destinations currently operated by ancient Boeing 767s and eventually ex-Qatar Airbus A330s and new Boeing 787s. Air Italy’s 737 MAX, while ordered by Qatar Airways, has a totally unique livery and product independent of Qatar Airways. While the aircraft is fresh and new, the interior product is rather in line with other major European airlines. Business class features the all too common middle-seat free economy style “Eurobiz” seating, sporting 32 inches of pitch. Back in economy class, seat pitch is said to be 29 inches. 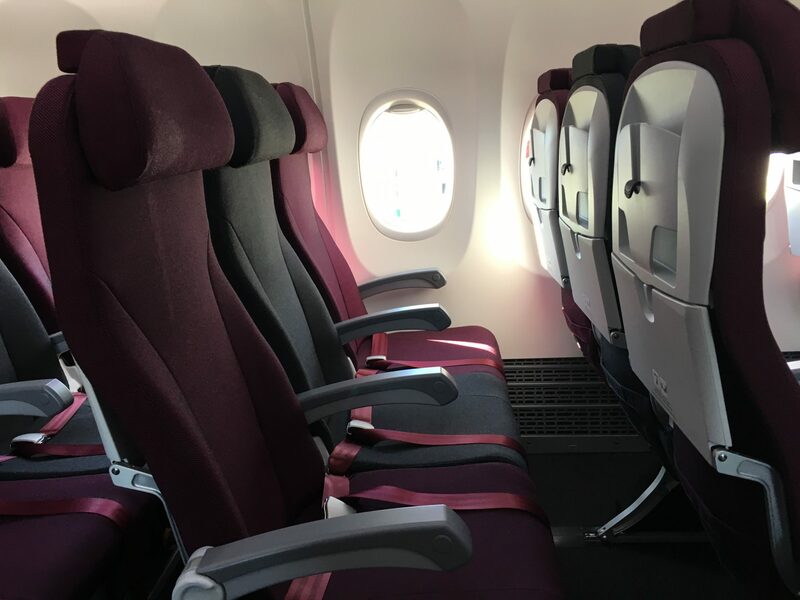 However, when your author got the chance to try Air Italy recently, the Zodiac Aerospace-supplied economy seats felt roomier than the figure quoted by Qatar Airways. At a height of 6’1”, I normally feel the squeeze on 29 inch-pitched seats. New generation slimline seats do an amazing job of maximizing knee room, but I feel as if the measurement provided by Qatar Airways may have been on the low end. 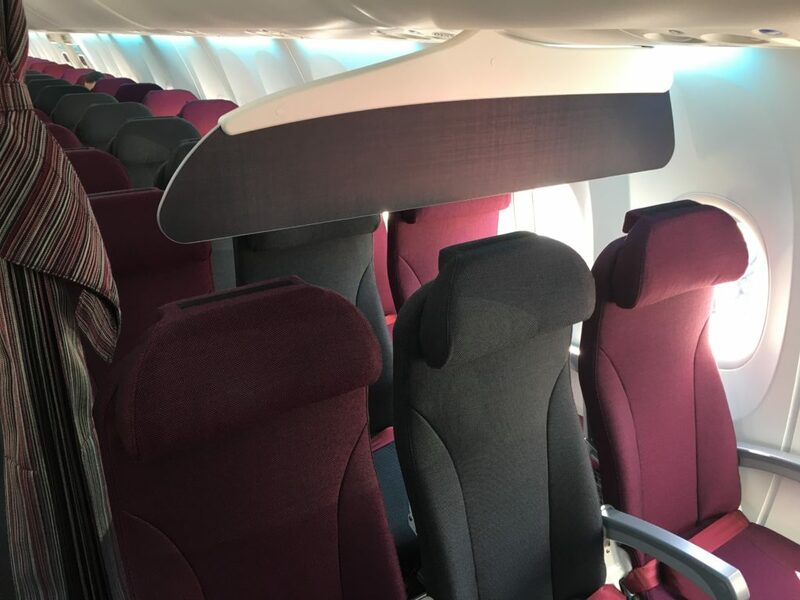 The seats are either black or burgundy, which more closely resembles the Qatar Airways color palette rather than symbolizing Italian design. All seats from nose to tail feature combination AC and USB power ports, which are still a rarity in Europe but are slowly becoming more common with Air Italy’s largest competitors. The power ports are the under-seat variety, which means many passengers will fail to notice their existence without the proper signage. Each seat is also equipped with a personal device holder, which is as difficult to spot as the power ports. It took a solid minute of fiddling to figure out how the mechanism worked. I succeeded after disregarding the “literature only” marking placed next to it. 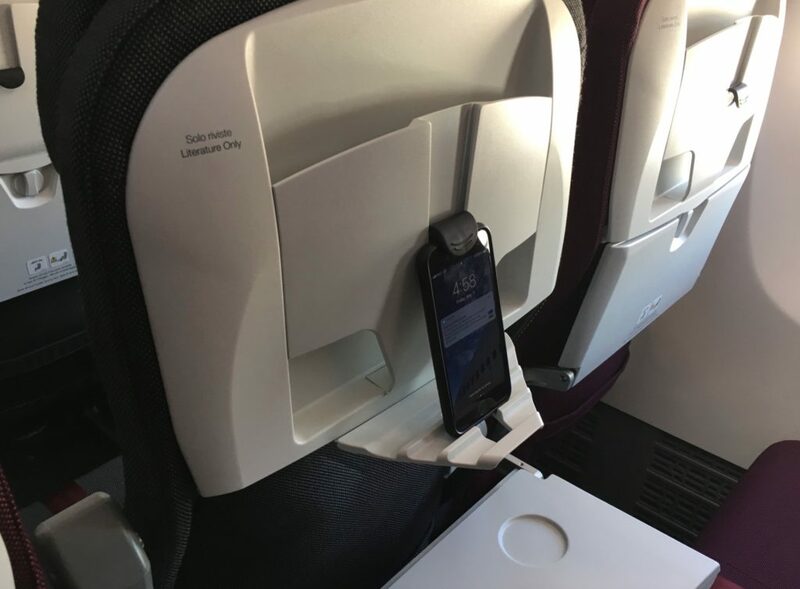 The aircraft does not feature any form of streaming entertainment or inflight connectivity to complement the power ports and device holders. 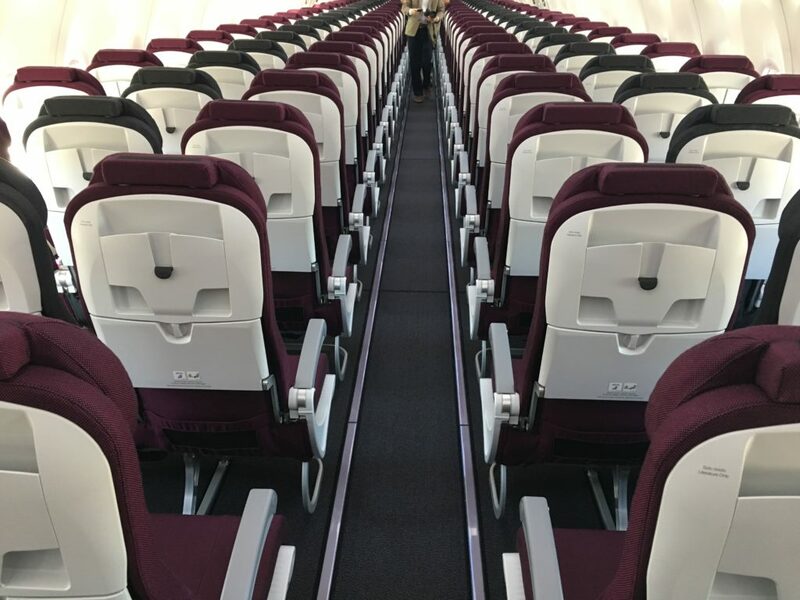 Qatar Airways is embracing broadband connectivity for its own longhaul fleet, and even has low-bandwidth connectivity on some A320s, so one wonders if the carrier will see the benefit of connectivity for Air Italy. This is an amenity that is quickly making its way into European narrowbody aircraft. As its interior products are not substantially differentiated from many other legacy European airlines, Air Italy must prove to passengers that its service standards and soft product are reason enough to book away from more familiar airlines. With Qatar Airways CEO Akbar Al Baker providing his own unique brand of guidance, your author believes that Air Italy will do just that. Air Italy has the opportunity to become a legitimate competitor in the markets it serves. I think I spot breathable fabric (now a luxury) upholstery instead of the cheap plastic faux-“leather” ones you see on other (lesser) carriers. Qatar is really good! 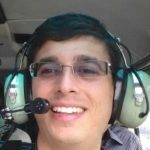 I totally agree with you on the point about the fabric rather than e-leather. This is a nice change.